Closeup of the route from below. After climbing the long pillar pitch, move left onto the upper ice that is only partially visible in photo. Approach: Park at Burstall Pass parking lot (signed) about 45 minutes from Canmore along the Smith Dorrien (AKA Spray Lakes) road. Bike as far as allowed up the Burstall Pass trail then continue on foot until it is possible to go up to the right into valley between Mt. Birdwood & Snow Peak. Hike up this valley a short ways and the climb will be obvious once it’s in sight. About 2.5 hours total. Route Description: This challenging route was first climbed in October 2010 and it is unknown if it forms regularly. The first pitch is a full 60 meters of technical chandeliered pillars, finding good screws is challenging. 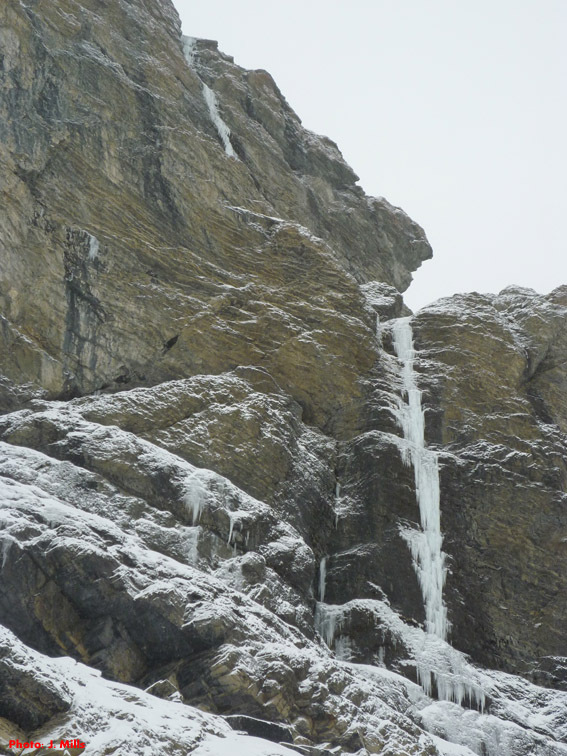 From here, make an easy traverse left to the base of a rock overhang and ice above. Pull through the left side of the 5 meter overhang and gain the WI4 ice above. There is no real gear to be had on the rock, but the hooks are fairly positive. The first ascentionists continued up to the summit of Snow Peak with no serious difficulties. 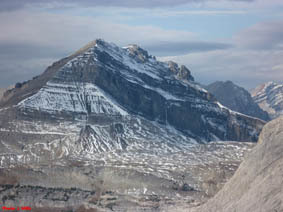 Snow Peak, with Moyen Monster in the center of photo. Picture taken from Burstall Peak. Descent: Rappel the route or continue to the summit and walk off left. Gear: A few pitons, a small rock rack, and screws including stubbies. Objective Hazards: Avalanche hazard on the approach slopes as well as from above. Not an issue in October during the first ascent.